We’re here to help! Below is a list of our frequently asked questions. Select one of the tabs below to find a question and answer. If your question has not been answered, please contact Broadway In Portland Customer Service so that we may be able to speak with you personally. Where do I go to get general information such as directions to the theater, parking information, box office hours, and other services offered by Broadway In Portland? You may visit our theater information page here. More information may also be found on the venue’s website. Broadway in Portland’s box office is open from 10am-5pm, Monday-Friday. Portland5’s box office is open from 10am-5pm, Monday-Friday, 10am-4pm Saturday. The Broadway in Portland Administrative Office is located at 211 SE Caruthers St., Portland, OR 97214 and open Monday-Friday from 10am-5pm. I have an emergency regarding my performance tonight/this weekend and the Box Office is closed. Who can I contact? We understand emergencies arise. Please email Broadway in Portland at Broadway@PortlandOpera.org to see how we can assist you. How does parking work at Keller Auditorium? Do you have valet parking? Detailed information about parking may be found here. Unfortunately, Keller Auditorium does not offer valet parking. Please allow extra time to park your vehicle and get to the theater! What security measures does Keller Auditorium have in place? Are any items prohibited at the venue? In order to ensure patron safety, security is always present at all performances. Bags are subject to search. Oversized bags will not be permitted in the theater. Outside food and beverage is not permitted inside Keller Auditorium. Can I purchase food and drinks at the performance? Are food and drink allowed inside the theatre? Food and drinks are typically sold in the lobby before shows and during intermission. Food and drinks are allowed inside the theater at the discretion of the presenter. If you are at a performance and want to know if you can take your food and drink inside, an usher can tell you the policy for the show you are attending. For a convenient dining option, make reservations at the Keller Café – on the 1st balcony level of Keller Auditorium – and have dinner at the show. What is the appropriate dress for attending a Broadway In Portland performance? There is no specific dress code. Most people enjoy dressing up to go to the theater, and some events such as opening nights will draw a dressier crowd, but for theatrical performances you will see people in everything from casual to formal wear. How early should I arrive for the performance? When do the theatre doors open? We recommend that you arrive at the venue at least 40 minutes before the performance to allow plenty of time to park and get seated. Theatre doors generally open for seating 30 minutes prior to the start of the show. What is your late seating policy? Please arrive on time out of courtesy for the performers and your fellow audience members. Arriving late may result in seating holds or alternate seating within the theater. Admission or re-admission of latecomers is ultimately subject to the producers’ discretion and guidelines for each individual show. How do I purchase merchandise? For most shows, merchandise may be sold in the lobby prior to the show and during intermission. 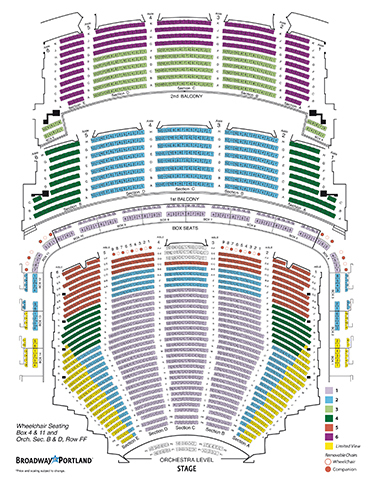 How can I view a seating chart for the theater? View our seating chart here. What kinds of accessible seating and services do you offer? A full list of accessible services for the venue may be found here. What is Limited View or Obstructed View seating? Limited View seats generally have a partial view of the stage due to the viewing angle in the theater. Obstructed View seats have a partially blocked view of the stage due to objects such as columns, railings, or sound equipment. To inquire about Limited or Obstructed View seats, please call us at 503-417-0573 (M-F, 10a-5p). Can I purchase tickets in person? Are there walk-up sales on the night of the show? Walk-up sales on the night of the show are subject to availability and cannot be guaranteed. What is the lottery and rush ticket policy? Lottery and rush ticket policies vary between productions and are often not determined until the day the show premieres. Please follow us on Facebook, Twitter or call us at 503-417-0573 (M-F, 10a-5p) for more information. If an in-person lottery or rush has been announced, please note that seating is always subject to availability and cannot be guaranteed. How do I purchase tickets for an individual show? When will tickets go on sale to the general public for a specific show? On-sale dates vary, but most shows tend to go on sale 2-3 months before they come to town. The best way to be notified when shows go on sale is to join our eCLUB, which you may sign up for here. Where can I find information about all of the shows playing in Broadway In Portland such as runtimes, show schedules, age recommendations, and more? Please visit our Shows page for general information about our upcoming productions. How can I purchase accessible seats for a person using a wheelchair? If you wish to purchase accessible seats for a production, please call us at 503-417-0573 (M-F, 10a-5p) or email us at Broadway@PortlandOpera.org. A full list of accessible services for the venue may be found here. Our eCLUB is a free electronic mailing list that gets you access to advance offers for select local Broadway shows BEFORE they go on sale to the public! You may also receive priority offers and discounts to other live entertainment events in your area, plus monthly eNewsletters and special offers from Broadway in New York City. Join our eCLUB here! I have a question about a priority offer or purchase I made through eCLUB. How can I contact a customer service representative? Please call our Broadway in Portland box office at 503-417-0573 (M-F, 10a-5p) or email us at Broadway@PortlandOpera.org. How do I sign into my eCLUB account? Visit your Account Manager here. Can I get a refund for my eCLUB ticket purchase? All sales are final and refunds cannot be given. How do I update my email subscription preferences? To update email preferences, log in to your account here. My tickets have been lost, stolen, or damaged. What should I do? If your tickets were misplaced or destroyed and you purchased them through an authorized ticket source (Broadway In Portland or Portland’5) a record of your sales transaction exists and we can accommodate you. Please contact your point of purchase as soon as possible to verify your options for replacement tickets. I purchased individual show tickets but missed my scheduled performance due to an emergency. What are my options? We understand that emergencies happen. Unfortunately, we are not able to honor unused tickets for a missed performance. No refunds can be given for past performances. What do I do if a performance is cancelled? What is the policy with regards to inclement weather? In the unlikely event that a performance is cancelled, Broadway In Portland and Portland’5 will inform customers via phone, email, or mail with information regarding the ticketing policy. Ticket holders are encouraged to return to their original point of purchase for more information. In cases of inclement weather, we strongly recommend that patrons travel safely and allow plenty of time to arrive at the theater. During inclement weather, updates will be posted on our Facebook, Twitter, and Instagram pages and on the Broadway In Portland homepage. I had an issue at a recent performance that I would like to speak to someone about. How can I contact a customer service representative? We advise all customers to contact their original point of sale. If you bought your tickets through an eCLUB email, you may call our box office at 503-417-0573 (M-F, 10a-5p) or email us at Broadway@PortlandOpera.org. Lucky Seat offers a limited number of tickets for certain performances to winners of a random drawing. More information about Lucky Seat and a list of current drawings may be found here. I have a question or issue regarding a Lucky Seat offer. Please reach out to Lucky Seat directly by emailing help@luckyseat.com. What is your child policy? Broadway In Portland requires that every person, regardless of age, must have a ticket. Age recommendations vary by production. Please visit our Shows page for performance descriptions and age recommendations. How can I request a ticket donation for an upcoming charity event? I’m running into an issue purchasing eCLUB tickets. What should I do? If you are receiving an error message, please call our Broadway in Portland box office at 503-417-0573 (M-F, 10a-5p) or email Broadway@PortlandOpera.org for assistance. I have forgotten my eCLUB account password or need to update it. How can I do this? If you have forgotten your password, click here to access your account login page. Click on “Forgot Password?” and enter the email address associated with your account. A temporary password will be emailed to you – click on the link provided in the email and enter your new password. If you do not have an account or password, or do not know the email address registered to your account, please contact our box office at 503-417-0573 (M-F, 10a-5p). How can I update the personal information on my account such as my name, mailing address, phone number, or email address? To update your personal information, log into your account here. At the top of the page, click the arrow next to your name and select “Your Account” from the drop-down menu, then select “Manage My Personal Profile” on the next page. I keep getting a spinning wheel when trying to purchase tickets. Is your website broken? In order to utilize our Interactive Seat Map, it may be required to update or install Adobe Flash Player on your web browser. Steps to enable on Chrome. Steps to enable on Firefox. Steps to enable on Internet Explorer. Steps to enable on Safari. What is a subscription or season ticket package? A season subscription allows you to purchase the same number of tickets for every show in our 6-show package. Whenever possible, your performances will fall on a set day of the week and time, and you will also have the same seat assignment for each show. More information about subscriptions and benefits can be found here. What are the benefits of being a season ticket holder? Please visit our Season page for more information about season ticket holder benefits. When do subscriptions go on sale? Season subscriptions usually go on sale around the first quarter of each year (January – March) when we announce the season lineup. To be notified when subscriptions become available, you may sign up for our eCLUB here. What are the fees associated with purchasing a season package? Premium Season Subscriptions (Orchestra Sections B-D, Rows PA-X and Center Boxes) include a $80 fee for each subscription seat purchased. Premium Season Subscribers receive priority access to premium seat locations, available only to these Subscribers, prior to tickets being placed on sale to the general public. Additional benefits including an exclusive entrance at Keller Auditorium for season package shows, invitations to special events and parties, and access to the Broadway Concierge Hotline in New York City are included in the Premium Season Subscription package. Premium subscribers receive all the convenience of season tickets, premium seating locations, and additional benefits exclusive to Premium subscribers. For more information about subscriptions and benefits, please visit our Season page. Do I have to pay for the entire season all at once? New and renewing subscribers have the option to take part in our interest-free Payment Plan when buying a season ticket package! Opting into the Payment Plan splits the total price of your season package into two installments, which we automatically charge to your card at no additional cost. For more information, please call us at 503-417-0573 (M-F, 10a-5p). I’m already a subscriber. How do I renew for next season? Renewals for each season usually begin in the first quarter of each year (January – March). Once the new season is announced, you will have until the renewal deadline to pay for your tickets by logging into your online account, calling us at 503-417-0573 (M-F, 10a-5pm), mailing your renewal to the address on your invoice, or bringing your invoice in person to our Broadway in Portland Box Office. What if I miss the renewal deadline? In an effort to make sure that you are notified of your season ticket renewal, you will receive multiple notices about renewing your seats. Once the deadline has passed your seats will be released to other subscribers, so please make sure to renew on time! If you have missed the renewal deadline but would still like to subscribe, please call us as soon as possible at 503-417-0573 (M-F, 10a-5p). Can I exchange into a new date or seats for one of my shows? This is one of the best benefits of becoming a Broadway in Portland Season Subscriber! If you are unable to attend your scheduled performance, you may exchange into another performance of the same production. You may also exchange or upgrade into new seats for the same performance. Exchanges may be made by calling our Subscriber Hotline at 503-417-0573 (M-F, 10a-5p), by logging into your online account here, or by coming to our in-person storefront at 211 SE Caruthers St, Portland, OR 97214, Monday-Friday 10am-5pm. Unfortunately, comparable seating cannot always be guaranteed. Deadline for ticket exchanges is the week prior to a show’s opening. The difference must be paid if exchanging into a higher priced performance or seat location. Your subscriber pricing, if applicable, will be honored if you exchange your tickets. However, when exchanging from a lower to a higher-priced performance or into premium seating, the price difference must be collected when processing the exchange. First exchange is free, the second and any subsequent exchanges will incur a $7 charge. I cannot attend the entire run of a show or have no interest in seeing one. What are my options? We apologize if there is a show in your season that you cannot make or have already seen; however, we are unable to offer you a refund on those tickets. Bear in mind that one of your subscriber benefits is the ability to exchange into another performance of the same show. You may also transfer your tickets to a friend or loved one for free by logging into your online account. Visit our Learn How to Manage My Tickets Online page [LINK] for instructions about online exchanges and transfers. If there is a show in another one of our markets that you would like to see, we may also be able to help through our City-to-City exchange program! Please note that all City-to-City exchanges must be completed at least two weeks prior to your original performance date. Please call 503-417-0573 (M-F, 10a-5p) for further information. How do I purchase additional tickets for a show? Once additional tickets and exchanges become available for subscribers, you may add tickets online here ,over the phone 503-417-0573 (M-F, 10a-5p), or in-person at 211 SE Caruthers St, Portland, OR 97214. Additional ticket orders for the 2018-19 Season will be limited to 8 tickets. Orders that exceed this limit will be cancelled without notice, including multiple orders on the same account, billing address, or credit card. Additional tickets purchased by phone or online will incur a $7 service charge. This service charge may be waived by purchasing tickets in-person at 211 SE Caruthers St, Portland, OR 97214. Additional tickets are subject to availability and sold on a first-come, first-served basis. To guarantee priority seating, please be sure to order your additional tickets before they go on sale to the general public. Show dates, on sale dates, times, prices, and artists are subject to change without notice. When do additional tickets and exchanges become available for subscribers? Although the exact time varies from season to season, additional tickets and exchanges are usually offered to subscribers in late spring or early summer, before the shows go on sale to the general public. We will send you an email notification with more information once additional tickets and exchanges become available. Can I purchase my usual subscription seats for Season Options? Season Options are not part of the main package and are sold to subscribers on a first-come, first-serve basis, so we cannot guarantee your usual seats for them. Bear in mind that these shows often play for shorter runs or have different schedules than main package shows. How do I purchase tickets to Broadway Across America/Broadway Across Canada shows in other cities? Broadway Across America makes ordering tickets for family, friends, and colleagues in a different city easy. Please call our subscriber hotline at 503-417-0573 (M-F, 10a-5p) and our representatives will be able to assist you with the purchase. For a list of cities within the Broadway Across America network visit BroadwayAcrossAmerica.com. Due to an emergency, I missed my scheduled performance. What are my options? We understand that emergencies happen. If an extenuating circumstance arose and you were unable to make the necessary exchange arrangements prior to the show, please contact Broadway in Portland as soon as possible at 503-417-0573 (M-F, 10a-5p) or email us at Broadway@PortlandOpera.org. During the weekend, you can visit the Broadway representative at Keller Auditorium’s Box Office. No refunds can be offered for past shows, and we will not be able to make accommodations after a show’s final performance. My season tickets have been lost, stolen, or damaged. What should I do? If your subscription tickets have been misplaced or destroyed, contact Broadway in Portland at 503-417-0573 (M-F, 10a-5p) or Broadway@PortlandOpera.org as soon as possible to request a reprint. How can I purchase or exchange into accessible seats for a subscription? What other kinds of accessible services do you offer? If you wish to purchase accessible seats for a subscription, please call us at 503-417-0573 (M-F, 10a-5p). A full list of accessible services for the venue may be found here. I would like to split my season tickets into individual accounts or give my account to a friend. Is this possible? You may send this as an email to Broadway@PortlandOpera.org or via standard mail to our office at 211 SE Caruthers St, Portland, OR 97214. Please be sure to send transfer requests well before the renewal deadline! Once new accounts have been created only the new account holders will be able to manage their tickets. Where can I find the terms and conditions of a season subscription? For a full list of Terms and Conditions, please visit this page. I would like to change my seating or performance day for the entire subscription. What do I need to do? During the renewal period, you may call us at 503-417-0573 (M-F, 10a-5p) to see if there are any options for changing your seats. Bear in mind that our inventory may be limited or unavailable at this time. Several weeks after the renewal deadline, all renewed subscribers will receive an email invitation to log in and browse options for subscription upgrades. Keep in mind that upgrades are possible only when seats become available through cancellations, meaning better seats may not be available in your desired performance day and time. You will retain your current seats if there are no upgrade opportunities that meet your needs. IMPORTANT: You must have a valid email address to receive notifications about upgrades. Please add Broadway@PortlandOpera.org to your safe senders list so you do not miss any emails from us. I’m running into an issue on my Account Manager. What should I do? Step-by-step instructions for managing your tickets online can be found here. If you are receiving an error message, please call us at 503-417-0573 (M-F, 10a-5p) or email Broadway@PortlandOpera.org for assistance. I have forgotten my password or need to update it. How can I do this? If you have forgotten your password, click here to visit the login page. Click on “Forgot Your Password,” then enter the Account Number or email address associated with your account and a temporary password will be sent to you. Click on the link provided in the email and enter your new password. If you do not have an Account Number or do not know the email address registered to your account, please contact our customer service hotline at 503-417-0573 (M-F, 10a-5p). If you know your password but need to change it, enter your Account Number or email address and current password to log in. Once you are logged in, select “Edit My Profile” on the left side of your screen. Under “Manage Your Settings” click on “Change My Password” to update your password. To update your personal information, log into your account here and click the “Edit My Profile” button on the lefthand side of the screen. I keep getting a spinning wheel when trying to purchase or exchange. Is your website broken? To update email preferences, please click here and submit the email address attached to your account. You will receive an email notification with more instructions. How many people constitute a group? The group minimum usually ranges from 10 to 15 people. Please visit our Groups page here for more information on individual productions and their policies. Are there discounts available for groups? Is there a difference in the discount depending on the size of my group? Special group rates are available on select performances, price levels, and engagements and generally range from 10% – 20% off per ticket. The size of your group can also affect the discount you receive – larger groups may be eligible for more of a discount. Are there any fees associated with purchasing group tickets? Tickets may be subjected to a per-ticket Group Sales and Facility fee. Additional fees may apply for online Group Sales orders or added-value special events. Are there Student or Senior rates available? Many shows do offer a special rate to student and senior groups. Please call your group sales team at 503-295-3509 (M-F, 10am-5pm) or email Groups@PortlandOpera.org to discuss the various options available to your group. What's “Early Bird” and how does that work? Early Bird pricing, if available, has a steeper group discount on select performances and price levels. Early Bird payments are typically due prior to the show’s public on-sale date. Should you require more seats after the Early Bird deadline has passed, we may be able to honor the same rate depending on the performance. How can I reserve tickets for a group of 10 or more? To fill out a group tickets request form, click here. You may also contact our Group Sales department at 503-295-3509 (M-F, 10am-5pm). Can I pick my own seats for my group? Does my group have to be placed together? As a group coordinator submitting a request form, you can specify a desired section and/or price level for your group. Group requests are filled on a first-come first-served basis from the best available inventory at the time of the order unless otherwise specified. In order to accommodate your request, your group may need to spread throughout the theater in multiple rows, sections, and/or price levels. If purchasing with a promo code online is available for your desired show, you will have the opportunity to select your exact seat locations. Please note that full payment is required at the time of your order when using a promo code. Do we need to pay for our tickets right away or can we be invoiced? Group clients may reserve tickets by paying a deposit, and will be invoiced for their seats to allow time to collect funds from group members. Deposits are nonrefundable but will go towards the balance of your order. Our Group Sales Department will give you more details on the payment options upon reservation. When purchasing online with a promo code, if available for your desired performance, full payment is due at time of checkout. How soon do I need to pay for the tickets I’ve requested? Payment dates on traditional group orders vary depending on the show and performance date. Typically, the deposit is due 30 days after your reservation date. When you receive your group contract with your reserved seat locations, the payment date(s) will be included. If you would like to make your full payment earlier than the final due date, you are more than welcome. If you have any questions regarding payment dates, please contact your Group Sales Department at 503-295-3509 (M-F, 10am-5pm). Where do I mail payments? Who do I make check(s) out to? Can I make payments in person? If you would like to pay in person, we request that you call ahead to schedule an appointment. Please call us at 503-295-3509 (M-F, 10am-5pm). Why do I need to sign the Group Sales Contract? The Group Sales Contract outlines the Group Sales policies and procedures. The signed contract must be sent back to us prior to or along with your payment information before we are able to process your payment. If you have requested multiple shows within a season you will need to sign a contract for each show. Can I add or subtract tickets to my reservation before the final payment is due? If you’ve submitted a group request and tickets are currently reserved on your account, you may adjust the number of seats as long as you maintain the group minimum. Once the final payment is made you may not subtract tickets, you may only add. When can I request group tickets? Do I have to wait until they are on sale to the general public? One of the many benefits of group tickets is that you do not need to wait until tickets are on sale to the public. You may submit a group request for most productions shortly after our season is announced. My group has already paid for our tickets. Are there refunds or exchanges if my group cannot attend the performance? There are no refunds or exchanges on group tickets. Are there complimentary tickets available for groups? Shows may offer complimentary tickets to large groups (typically groups of 40+). Please contact your Group Sales Department for more details. How soon will I hear from a Group Sales representative after I have submitted a ticket request form? We aim to respond to all inquiries within 1-2 business days, but sometimes we experience a heavy volume of requests and it may take a little longer. If you have not received a response within a week, please call 503-295-3509 (M-F, 10am-5pm) or email Groups@PortlandOpera.org to check the status of your order. How and when do I get my Group tickets? Once your final payment has been processed, your tickets will be printed and shipped to the address on your account. There is no additional cost for postage. Tickets purchased closer to the performance date may need to be held at the box office for will call pick-up. In that case, one individual must pick up all tickets and distribute them to the group. Please notify the Group Sales Department when making your final payment if you have any ticket shipping questions. What do I do if someone in my group needs accessible seating? If you are filling out an online request form, please highlight the accessible need in the comments section, or contact a Group Sales Representative prior to filling out the form to address the request. Someone in my group lost their ticket(s). What do I do? If tickets are lost or misplaced, please notify the Group Sales Department immediately for assistance on reissuing the tickets. We cannot assist with reissuing tickets without exact seat numbers, so please keep track of locations when distributing tickets to group members. Once a ticket is reissued with a new barcode the original ticket will be voided for use to enter the theater. I have a promo code or discount through my employer. How should I purchase tickets? If you have a promo code through your employer, you will need your company’s specific link and promo code to purchase online. Each company with their own promo code has a contact person who receives the link and code at the beginning of the season and any updated codes throughout the season if necessary. If you’re unsure who that person is, please call or email the group sales department. Can we get tickets to other cities through you? While Broadway Across America has many cities in its network, we are only able to help you with Group Sales in Portland. However, we’d be happy to put you in touch with our colleagues in other cities so you may book your group tickets. You’ll be sure to get the same great service from our colleagues as you have from us! For a full list of cities in our network, please visit www.BroadwayAcrossAmerica.com. I’m running into an issue on your website. What should I do? If you are receiving an error message or having trouble with a Groups purchase or Promo Code, please call us at 503.295.3509 or email groups@portlandopera.org for assistance. Go to your account login here and click on “Forgot Your Password,” then enter the Account Number or email address associated with your account and a temporary password will be sent to you. Click on the link provided in the email and enter your new password. If you know your password but need to change it, enter your Account Number or email address and current password to log in. Once you are logged in, under “Manage Your Settings” click on “Change My Password” to update your password. To update your personal information, log into your account here and click “Edit My Profile” Be sure to save your changes! I keep getting a spinning wheel when trying to purchase. Is your website broken?